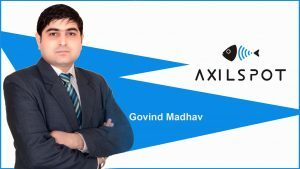 AXILSPOT, a global leader in wireless network equipment for enterprises has announced the appointment of Govind Madhav as Product Management & Presales Head. Mr. Madhav will be based at New Delhi office of AXILSPOT which the company has recently inaugurated and is eying for aggressive expansion in India via strategic partnerships with channel partners and System Integrators. The company is also in extensively expanding its workforce in the country and is roping in top level executives for PAN India operations. Based out of Delhi, Chatterjee will be leveraging his expertise to help AXILSPOT aggressively participate in ambitious IT initiatives in the country including “Digital India” and “100 Smart Cities” with its comprehensive state of the art line up of enterprise-grade wireless networking solutions. He incorporates a vast pool of experience (8 years) in the field of sales for technology vendors. His previous stint includes Pronto Networks, where he helped the company in expanding its footprint across the country. Prior to Pronto Networks he also worked with Zen Exim Pvt. Ltd. which comes as a national Value Added Distributor (VAD) of wireless and networking solutions and iValue Infosolutions Pvt. Ltd., the national VAD of wireless, networking and security solutions. His key expertise centres around wireless, networking and security, while during his leisure time he enjoys reading, listening to music and travelling. “We are elated to have Mr Govind Madhav onboard to amplify brand AXILSPOT in India. With an astonishing knowledge and experience in wireless and networking solutions and deployment, he will be a real asset in promoting the brand and expanding AXILSPOT in India, ensuring high-end delivery of wireless solutions”, said Pinaki Chatterjee, Regional Director (India & SAARC), AXILSPOT on the appointment. “I’m glad to be a part of AXILSPOT which is committed to support initiatives like Smart Cities and Digital India Programme via its cutting edge wireless networking solutions for enterprises. I look forward to help our esteemed customers integrate the most suitable networking solutions to help scale up their business operations”, said Govind Madhav on his appointment. He has also been aggressively engaged in pre-sales technical roles wherein he identified the customer’s technological and business-oriented requirements and helped the client deploy the most relevant and customised solution to help the business become agiler. To know more please visit http://www.AXILSPOT.com/.